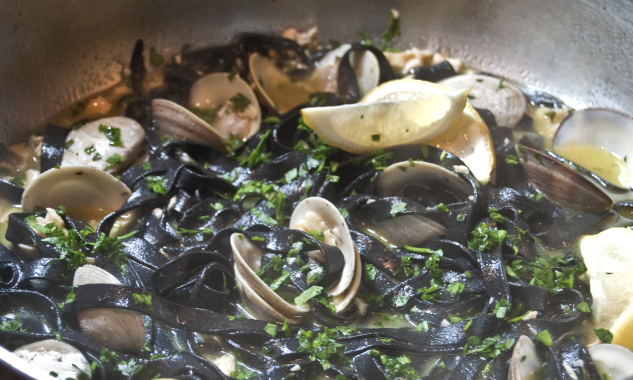 A while back I posted a recipe for squid ink pasta. This rich velvety pasta will put any store brand to shame. I have not had pasta since I made the pasta from scratch and I am afraid to make anything else... Today I am finally sharing the two sauces with you! I made a classic pasta con le vongole and also a tomato cream version. I am so grateful to have incredible talented friends in my life. Having the opportunity to cook with Maria was something that I have been looking forward to for a while - I cannot wait to learn how to make homemade gnocchi! One thing that I know I need to try to pick up from her is the ability to throw together meals without using recipes. I get nervous and second guess my instincts while doing this. However, there is no better way to get better at cooking than trial and error. One important trick to learn is to use simple recipes as a springboard to create other recipes. In today's post, you will see a classic pasta con le vongole as the base for our meal. From here we added some tomato paste and heavy cream to turn it into a delicious tomato cream sauce. Both sauces pair well with the squid ink pasta. While they use the same basic recipe, the slight adjustments create an entirely different flavor. Give them both a try and let me know what you think - white sauce or tomato cream? Bring a large pot of salted water to a boil and cook the pasta until al dente. Meanwhile, warm 1/2 cup of the olive oil and chili flakes in a high-sided saucepan set over medium-high heat. Add the garlic and cook until softened, about 2 minutes. Add the wine and allow it to cook away slightly, about 1 minute. Add the chopped clams and their juices then season with salt and pepper. Stir and cook about 2 minutes. Remove from the heat. Stir in the butter gradually to emulsify. Drain the pasta and toss into the sauce pan and stir well to coat pasta. Add whole clams on top. Place a lid on the pan (a glass one will allow you to see that the clams are opening). Once all of the whole clams have opened (discard those that remain closed), stir and then distribute evenly among six dinner plates. Top with equal portions of the remaining sauce and serve immediately. Serve with fresh crusty bread and more Pinot Grigio! Add 2 tablespoons organic Italian tomato paste before adding clams and then add 1/4 cup heavy cream instead of butter addition in 1st recipe.